The teen has just burnt a pan of lentils. She was making some for her to take to college for lunch tomorrow and she used the last of the puy lentils we have in the house. She is currently trying very hard not to slam the cupboard doors as she clears up the mess and the burnt pan. She is not a happy kid as she is faced with having to eat a canteen lunch tomorrow. I was going to suggest making an alternative version but decided to bite my tongue and beat a hasty retreat instead. In the kitchen cupboard we have a good selection of pulses : brown lentils, yellow split peas, chana dahl, chickpeas, kidney beans, black eye peas, cannelini and haricot, just off the top of my head. But I know that not one of these will make an acceptable substitute for her, not today. So the teen thinks she is going hungry and the world is a dark dank place. When I was her age, doing A-levels, I attended a college with tertiary and sixth form classes on the same site. The subsidised canteen was run by the City & Guilds catering students, and the food was good (most of the time!). That didn't stop me though, on a quest to save my allowance and part-time wages for the weekends. I would walk the mile and a half each way and eat the cheapest food I could buy there. The canteen sold breakfast sandwiches, 3 course lunches and proper puddings but it didn't take long to work out the cheapest foods on offer. On the average day, it was a heaped plate of plain white rice with beansprouts,which off the top of my head (and we are going back a few years) cost 26p, 15p for the rice, 11p for the beansprouts. I know it sounds as though I was being really tight, and I probably was, but I really enjoyed the food. It was simple, fresh and filling. They had soy sauce behind the counter and with a beg and a smile, a dash of dark rich soy and a bit of fresh salad, this was a fine meal. There was one dark shadow that could spoil the meal though, and I have never, ever understood this. The beansprouts were baked "au gratin". Yes, really. A deep gastronorm tray of beansprouts seasoned then pushed under a grill with a thick layer of sharp catering cheddar-style cheese. You had to avoid the cheese and there was a knack to doing it. The dinner ladies thought that the cheesey topping was the best part of the dish, so they would bestow it with a smile and a heavy hand to favoured students and wouldn't take no for an answer. The only way to solve the problem was to arrive about 5 minutes after the canteen opened. This would ensure that you weren't first in the queue, the staff were fairly busy and would already have bestowed their gift of cheese on earlier visitors meaning you would likely as not get a scoop of slightly softened sprouts missing the dreaded cheese. I have no idea why they made beansprouts au gratin though I am glad to say that I have never seen it on a menu since. If you have, you may well have been eating the food created by one of my north London college alumni (sorry!). So back to the task in hand. This is the recipe that the teen was making. 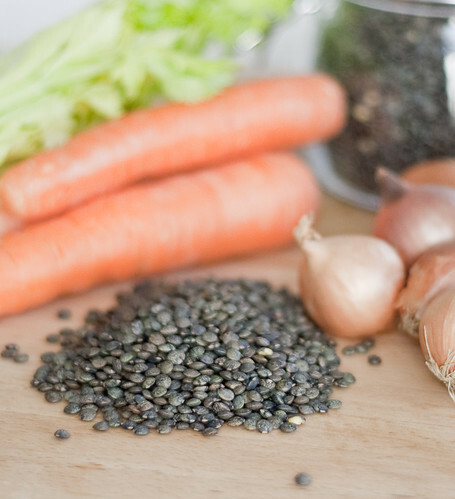 These lentils can be served as a side or a vegetarian main, or tossed in a vinaigrette, they can be served as a salad. They are really popular in our house and were eaten with glee by our kids when other vegetables were shunned. The lentils will stay firm if you leave them to stand after they have boiled but if you are pushed for time, you can simmer them a little more (adding a little extra water) for around 15 minutes instead. Dice the celery and carrots and finely chop the garlic. Pour 1 dsp olive oil into a heavy bottomed saucepan with a lid. Heat gently then add the garlic and vegetables and stir, allowing to soften in the oil, about 10 mins. Add the lentils and turn in the oil until covered. Pour on cold water until the lentils are covered, about 2 cm above the surface of the lentils. Add the bay leaves and thyme, cover with a lid. Bring to the boil and turn down to a gentle boil for 10 mins. Turn the heat off after 10 minutes and leave to stand for 30 minutes. The lentils should cook through but will still have some bite (ie not mushy). Remove the bay leaves and thyme stems. Bring to the boil again with the lid off. Add the zest and juice of the lemon and season to taste. Pour over the 2nd dsp of olive oil and stir through, serve. Add the lemon zest and juice along with the 2nd dsp olive oil. Season to taste and serve with chopped parsley. I was bought up on the Bean Book, so have rather a fondness for lentils. We didn't have Puy lentils in those days, but I've got to know them well now. I love these sort of simple dishes - not quite so good if the pan gets burnt though. Interesting post, thanks for the canteen story. I hate to imagine what beansprouts au gratin tasted like! Nothing like that in our uni canteen, scotch pie and beans at lunch time and egg and chips at night. Eventually I got a decent kitchen and started to make my own proper food. youre missing the dijon mustard and red wne vinegar and rock salt- thi makes it a traditional French lentil salad, our family favourite! Buy "A Hand for Haiti" E-recipe book NOW!